Between 1479-80 Leonardo is thought to have painted the Madonna and Child (Benois Madonna) and the unfinished St. Jerome. Ludovico Sforza becomes Regent of Milan. 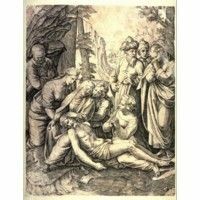 Birth of Marcantonio Raimondi, engraver who pioneered the use of prints to reproduce the work of other artists. He moved to Rome in 1510, and worked principally for Raphael, engraving his paintings and drawings.